Review on Maastricht concerts and fan contacts. By Ineke, July 27th 2011. For the seventh year in a row André performed in his hometown of Maastricht and for the seventh year Ruud and I were there! Traditionally we arrive on Thursday, one day before the start of the concert series. We put the banners up in the afternoon and hope to see the dress rehearsal that Thursday evening. This year it rained! André spoke in English during the dress rehearsal, since the recordings were being made by the Australian company CinemaLive. It is very funny to see and hear the communications between André and the recording truck. Sometimes he has to do things twice. He speaks his text, the orchestra starts to play the introduction of a music piece and before the soloist can sing one single note, André stops the music. On Friday we purchased a few beer glasses, called "Rieukes", in the bookstore of the Dominican Church. That is a very interesting bookstore and coffee corner, in a beautiful church. The profits of the glasses go to the "Museum of the Vrijthof" for their renovation and refurbishing. I am curious how many glasses were sold during the two weekends! We also attended Marc Rieu's exhibition in the Theater of the Vrijthof. Marc told us that he sold quite a lot of paintings, so he was very happy. In the afternoon we went to the ship to decorate it in André style. Alice Leung had sent us new flags and we added new international flags to the chain of flags on the boat. For the first time we had Argentinean and Swedish fans on board. Traditionally Ruth Morgan made buttons and key rings for the fans, to take with them for free. A camera crew from CinemaLive wanted to interview some fans and we said: "Welcome to the ship, here you can find fans from all over the world"! We had a total of 95 fans on board, and you can watch a video impression here on our web site. André played Antony Hopkins' waltz during the first Friday concert. Sir Antony was in the audience, walked with crutches (due to a broken ankle), but left the concert before it was finished, to avoid the mass of media/fan attention. Spectacular was Mirusia's flying act as "Mary Poppins". Except for these two new pieces, "The Waltz goes on" and "Mary Poppins", the program was rather the same. The gospel choirs sang the same songs, trio St. Petersburg played the same pieces. We have them all on DVDs. At first sight I found it disappointing, but André succeeded again to make it a magical night and atmosphere! During the first concert (the Bolero was played) an ambulance without sirens appeared on the Vrijthof along the terraces. The next day we read in the paper that André fans on the terrace had given first aid and saved the life of a German lady who had a heart attack. Doctors in the hospital said that she would not have survived without the immediate aid! Ruud and I had tickets for the Saturday night concert. Unfortunately it rained all night. 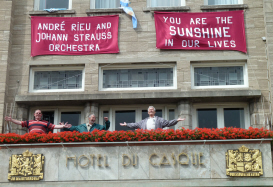 When André walked along the banners (under an umbrella), he looked up and we heard him say to Mireille: "…Mmmmm…. Sunshine …. huhhh?" We thought the slogan was just right: even in the rain, he is our sunshine! So we happily sat under a poncho for three full hours. 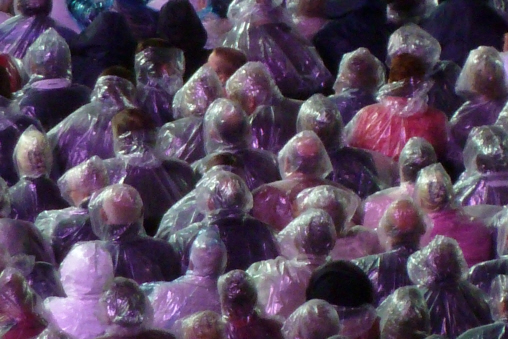 So did the new mayor of Maastricht and his renowned guests… All had a poncho on! André was joking about the Vrijthof being "the biggest swimming pool" of Maastricht. We were wet and cold, but our hearts were warm. During the intermission I left my seat to talk to some fans, and when I returned and sat down…… oops….. my bottom was totally wet! (But my seat was immediately dry!). Nevertheless the audience was responsive, although not too many standing ovations for the reason I just mentioned! Later on we heard from one of the performers on stage that it looked like 10.000 condoms sitting on the square….. If you watch the photo you can judge for yourself. 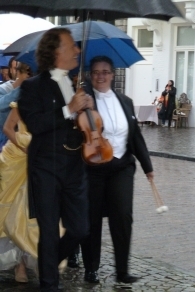 All the other concert nights André did not play Sir Antony's waltz any more….. We wondered why…. On Sunday we had a terrace dinner arrangement booked with Brasserie Monopole. Dress code: White! Our granddaughter Natascha joined us during the first weekend. When the Blue Danube was played, Ruud waltzed (for the first time!) with me, and Natascha waltzed with Jim. In between the concerts, we made some day trips in the surroundings of Maastricht. One of our missions was to find André's statue, which was removed from Maastricht by the artist. 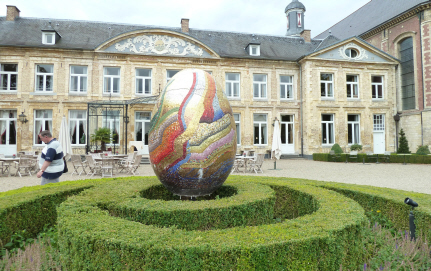 We found it in the beautiful gardens of the Chateau Hotel Saint Gerlach, only 9 kilometers from Maastricht. (Description of the day trip (by train) can be found on our web site on the city walks page). The rural estate of St. Gerlach was a convent and a church. The church is still there, with the tomb of St. Gerlach, but the convent has been converted into a restaurant and hotel. Many art sculptures are displayed in the gardens, also André's. I have to admit, it is a lovely place for the statue. Hideo and Mihoko Kogawa had already mailed us that their friend Tao Koji from Japan was attending a concert. We met the Koji family and they told us that their five year old boy Tao Jr. also started to play the violin. When André signed the boy's violin, they were so happy! Ten year old Kurt, Marcette Falzon's son (from Malta) also had his violin signed by André. They will never forget the days in Maastricht. Let's hope they will be the next generation of violin players, inspired by André! As soon as the last (6th) concert was finished, André's crew started to tear down the seats. The next morning almost everything was gone already. We said goodbye to our international friends, knowing that we'll see each other again next year. 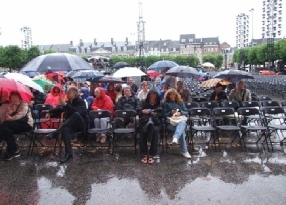 "Maastricht" is a very big reunion of fan friends. The group becomes bigger every year. Facebook and the web sites are the places where we meet!! 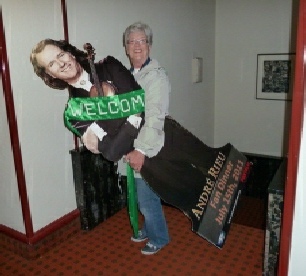 We took our cardboard André under the arm, said good bye to Maastricht and went home….